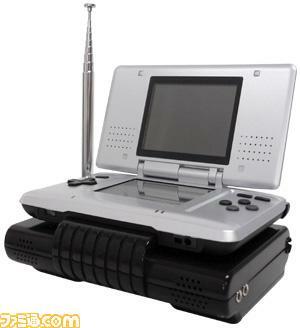 Giant Nintendo DS TV Tuner | OhGizmo! If you absolutely, positively must watch TV on your Nintendo DS, then perhaps this mammoth of an accessory might be the thing for you. It’s a TV tuner for not only the DS, but the Gameboy Advance and Advance SP, and it’s coming out in the Land of the Rising Sun on April 29th for an unspecified number of yen. The included A/V cables also allow you to use these devices to watch DVDs, or even play another console (xbox, PSwhatever, etc.) through the handheld’s screens. Why you wouldn’t just buy a small portable TV however, is beyond me. No word on price just yet. I like to eat chicken noodle soup, espescially with grapes and cheese! Does anyone know if the GBA TV tuner works with the DS?